Interesting find: I’m spec’ing out a new iMac and find that Apple is still offering Aperture as a pro software upgrade. But wait, didn’t they officially say they’re discontinuing Aperture? And that support will be kaput by the end of the year? Why would they continue to offer a pro-level application if it’s not long for this world? My only thought is that, since they don’t have the Photos app ready to replace Aperture, they have to have something in that video/audio/photo lineup. 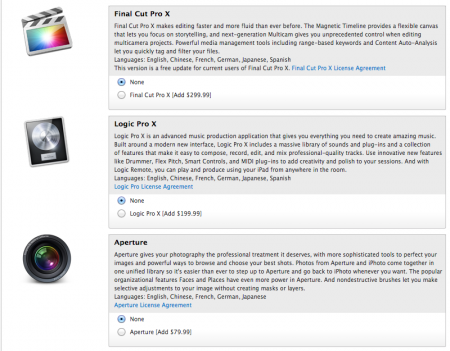 Aperture is also still listed under their “Pro Apps” section of the Mac page on Apple’s website. And nothing on the Aperture page about being discontinued. App buyers can still plunk down their $79.99 and purchase it with no warning. Posted by davelawrence8 at 12:43 pm on August 1st, 2014. No comments... » Categories: apple, software. Tags: aperture, apple, mac. Subscribe via RSS.